Every driver should be aware of how dangerous it is to drink and drive. However, driving drowsy can be just as deadly as driving drunk. Sleepiness hinders your reaction time, decreases awareness, and impairs your judgment, just like drugs or alcohol. In fact, people who are very sleepy behave in similar ways to people who are drunk. Fatigue can set in at any time. When you are tired, your ability to react, concentrate, and make complex driving decisions is impaired. Here are some symptoms of sleepiness to look for. If you have any of them, pull off the road as soon as possible and find a place to sleep. ● You have trouble keeping your eyes open and focused. ● You drift off the road and hit the rumble strips. ● You can’t keep your head up. ● You yawn frequently or rub your eyes repeatedly. If you have even one of these symptoms, you could be sleepier than you think. Pull off the road and take a nap. It also helps to drive during your normal waking hours. 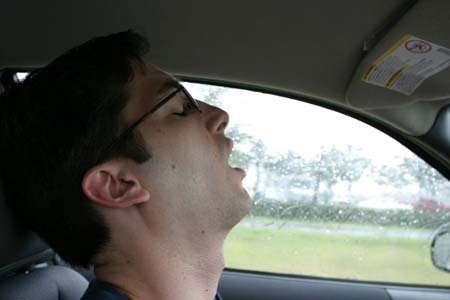 If you drive at times when you’re normally asleep, you will be fighting your natural sleep rhythms and have a greater likelihood of falling asleep at the wheel. Keep shifting your eyes. Look at different objects: near and far, left and right. Read the road signs as you approach them. Check your rearview mirror. Stop often. Even if you are feeling well you should stop at least every two (2) hours or every 100 miles. Get out of your car and walk around. Allow your muscles to relax. Do not drive more than eight (8) hours per day. For more great driving safety tips, discounts for auto insurance or point reduction check out our online defensive driving course.